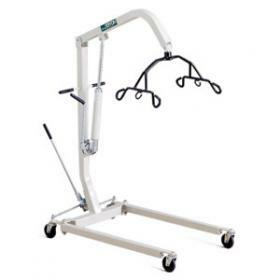 Hoyer classic manual lift HML400 with 6-Point Cradle has an angular design with a non-sway cradle for extra stability. HML400 Classic Manual Lift has convenient rotating pump-handle that allows operation from both sides of the lifter. HML400 Manual Lift has full travel height that allows lifting from the floor and the easy-to-adjust base legs lock securely into position.